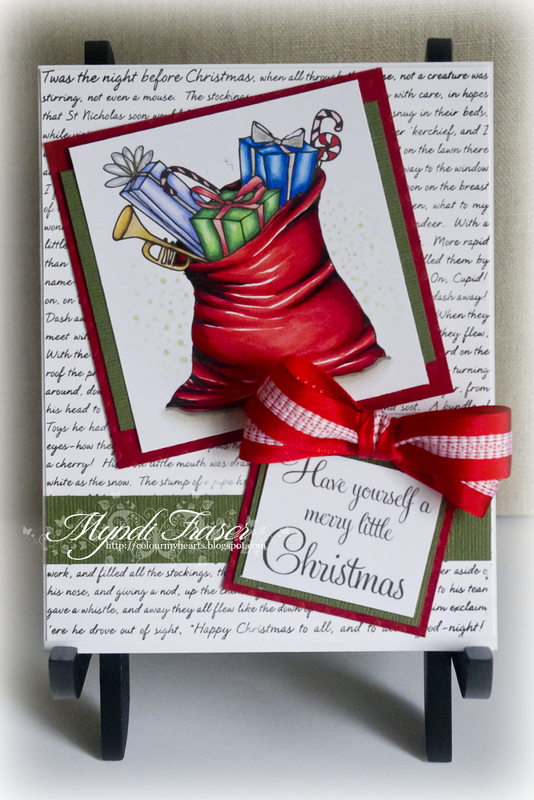 Today is the Rubbernecker DT's Team 1 Sweet Sunday, and I'm bringing you the new release "Bag of Toys" stamp, along with the "Twas the Night" background stamp, and the "Merry Little Christmas" sentiment. As usual, I used Copic markers to colour the image. The detail on the background stamp is incredible. The lines or so great you can easily read every work. 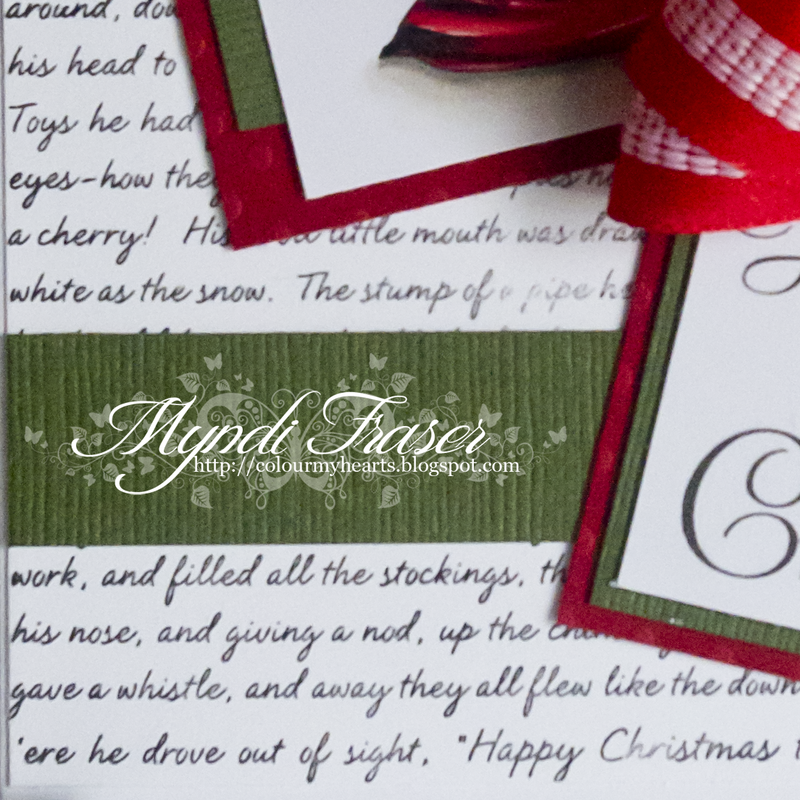 I stamped it in black pigment ink and heat embossed it with clear embossing powder. 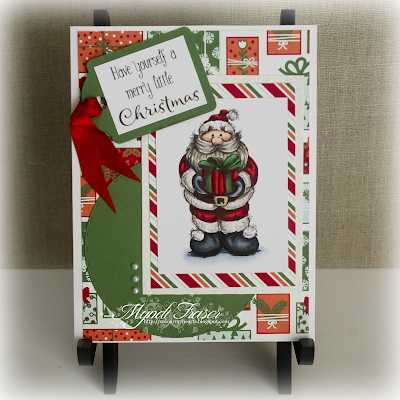 I just used scraps from my stash to create this card. I don't like to waste paper! The ribbon is from May Arts. The kind people at Rubbernecker sent us all a whole bunch to work with and I had a hard time deciding which ribbon to use. Remember, commenting on our Design Team's posts every week automatically enters you to win all of the stamps used on one of the DT's gal's project. We don't know which designer's project will be chosen, and the winner will be chosen by random. So visit the Rubbernecker blog, leave some kind words on all of our DT's blogs, and maybe you will be this week's winner! For all the details visit the challenge page on the blog HERE. It's time for a new release from The East Wind!! This one is a real cutie, and I coloured it up in record time so I could get it done before we headed out on a road trip! And I should be packing right now actually, so this post is going to be short and sweet! Here is "Kitty Trand" for your crafting pleasure. I went with a dark shabby chic theme (if there is such a thing) with this card. I think my daughter will really like it as a fun "just because" card. I'll run down the recipe real fast and get back to my packing before my husband comes home and gets mad because I'm not ready to hit the road. lol!!! C and W's for the greys, plus some glitter gel pen for her shirt sleeves which actually look like they have sequins on them if you see them in person. The effect actually came out really well! Make sure you head over to The East Wind's Facebook group and join in on our current dark themed challenge. There are also twice monthly challenges on the blog and the freebie is about to go out on the first, so make sure you are signed up for the newsletter!! Look for the bright pink box on the homepage. 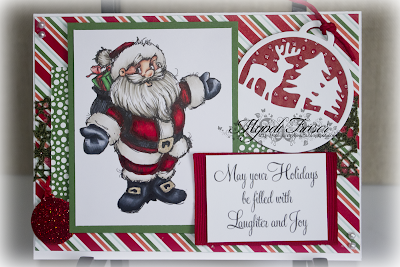 Rubbernecker Stamps coming at you today with this awesome "Santa Needs A Hug" rubber stamp. I love all of these new Santa stamps. They are just perfect. I also used the "Laughter and Joy" sentiment stamp (also new). I coloured the stamp with Copics. All of my paper is from Stampin' Up. I actually matted the sentiment on an extra wide piece of ribbon. How do you like my little ornament die cuts?? I got a new die set from Stampin' Up, and all the dies are just too cute! I can see making lots of gift tags this Christmas. Remember, commenting on our Design Team's posts every week automatically enters you to win all of the stamps used on one of the DT gal's project. We don't know which designer's project will be chosen, and the winner will be chosen by random. So visit the Rubbernecker blog, leave some kind words on all of our DT's blogs, and maybe you will be this week's winner! For all the details visit the challenge page on the blog HERE. It's that time again! Time for a new challenge at The East Wind's Facebook group. The theme this month is "Come Over To The Dark Side" (use a dark themed image). I used "Creepmas Girl" to make a creepy little Christmas card. Please stop by the Facebook group and join in on the challenge this month. First place prize is 3 TEW digis of your choice; second place is a 25% off coupon to the TEW Etsy store. As always, make sure you are signed up for the newsletter on the BLOG. A free image is sent out on the first of every month!! You don't want to miss that! 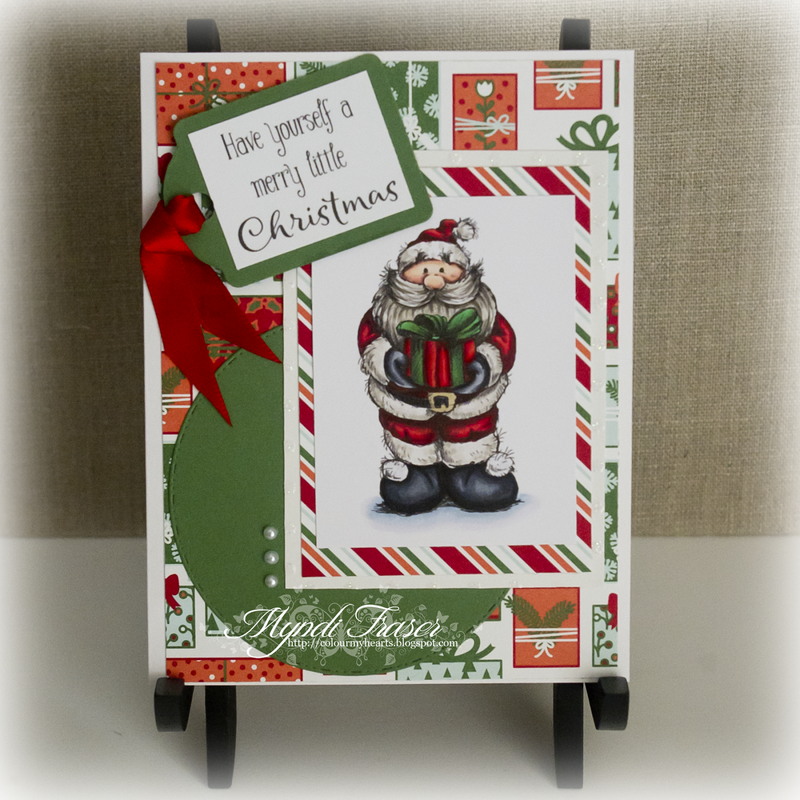 We are getting ready for Christmas at Rubbernecker Stamps! 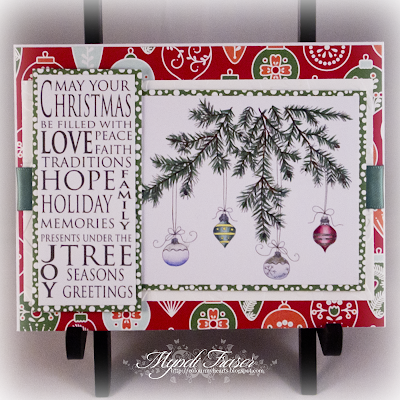 There was an awesome new release a few weeks ago of some amazing new Christmas inspired stamps, and the DT is going to be using those new stamps to hopefully inspire you in your own Christmas card making endeavours. Today I am using "Santa With Present". I also used the new sentiment stamp "Have Yourself". I coloured the image with Copics. The DP is from Stampin' Up, as is the tag punch. I coloured the image with Copics, but also used Prismacolor pencils on her hair. That curly hair really gave me a hard time! I was frustrated with how to colour it, and ended up adding ringlet shapes with a black cherry coloured pencil. Please stop by The East Wind's Facebook page and join in on the monthly challenge. This month's theme is "Leaf Me Alone" and goes until the 17th, so there are a few more days to pop a project in the challenge folder. Just see the pinned post at the top of the group page. Also, make sure you are signed up for the newsletter on the blog so you get your free image on the first of every month. October is flying by and November 1 will be here before you know it! 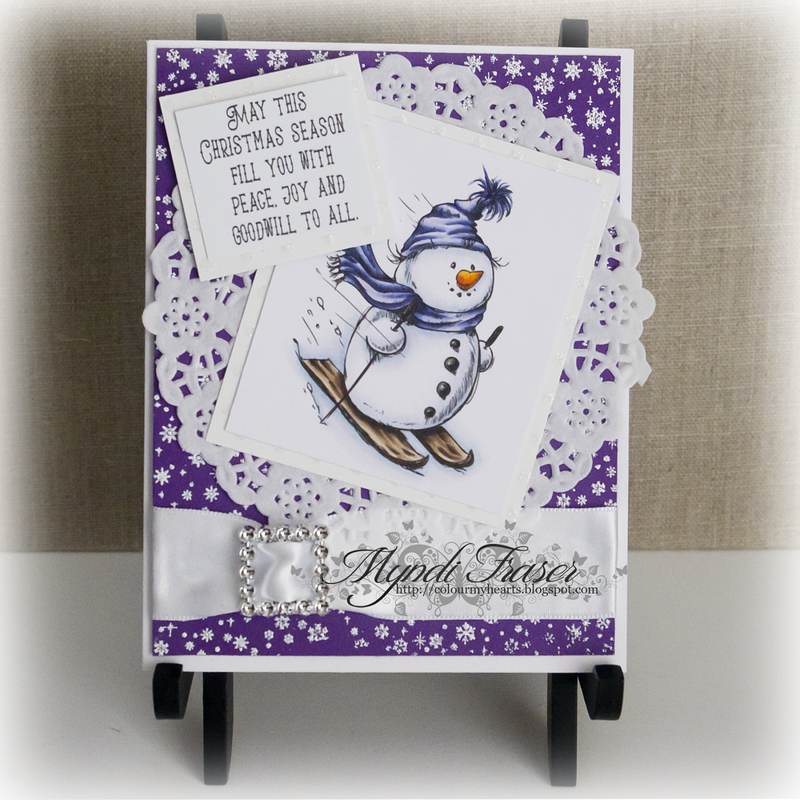 It is Team 1's week again at Rubbernecker Stamps and I am getting things started this week with this new release stamp called Snowman Skiing. I went with an untraditional Christmas colour because, why not?? I love purple, and I actually don't craft with it very often, for reasons that elude me. 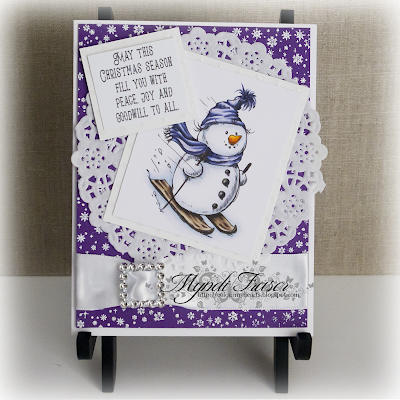 In addition to the Snowman Skiing stamp, I also used the new sentiment stamp "Peace, Joy, and Goodwill", along with the Snowflake Panel background stamp. I used opaque silver bling embossing powder with the Snowflake stamp and it came out beautifully. The stamp is so well made, and the details on the snowflakes came out awesome! The ribbon and buckle are both from Live & Love Crafts. I actually used white iridescent paper for the mat behind the snowman and sentiment, which does not seem to show up in the picture, but it's nice and sparkly in person. 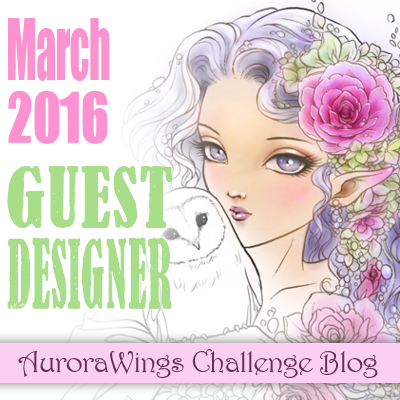 The new challenge is up at Aurora Wings and the theme this time is "Black and Orange and One Other Color". I picked my one other colour to be purple. I wanted a colour that was totally away from the orange colour family, so red and yellow were out! 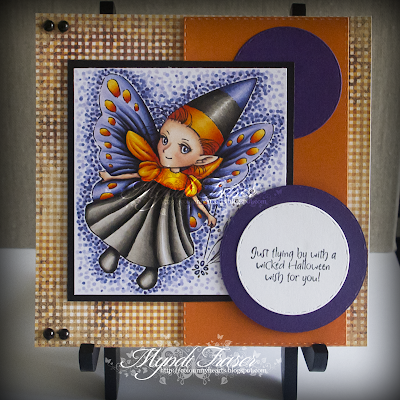 I made a cute little Halloween card with Candy Corn Fairy. 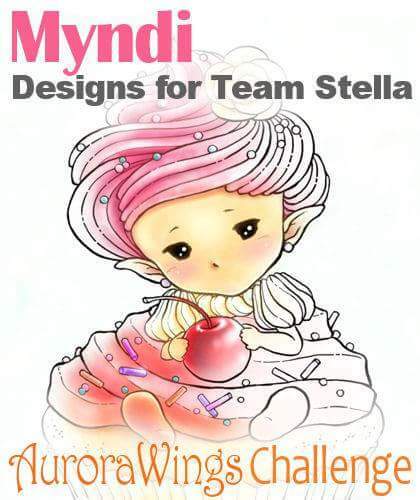 Make sure you drop by the Aurora Wings Challenge blog to check out this challenge and take a look at the rest of Team Stella and their fantastic creations! 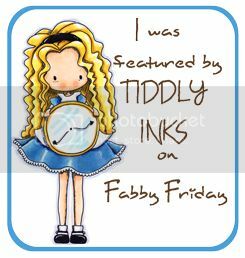 Today I have a new stamp release for you from Rubbernecker Stamps. It is called "Ornament Branches". 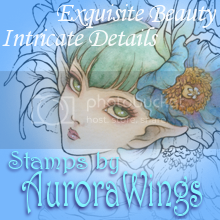 It is a lovely simple stamp that I chose to colour up with my Copics. I just traced over the lines of the stamp with my markers to give it a little flair, and then coloured in the ornaments. 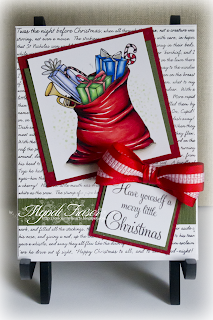 I also used the new "Christmas Be Filled" sentiment stamp. The DP is from Stampin' Up. Please check out our other DT creations at the Rubbernecker blog HERE. They are so fantastic and such an inspiration!! 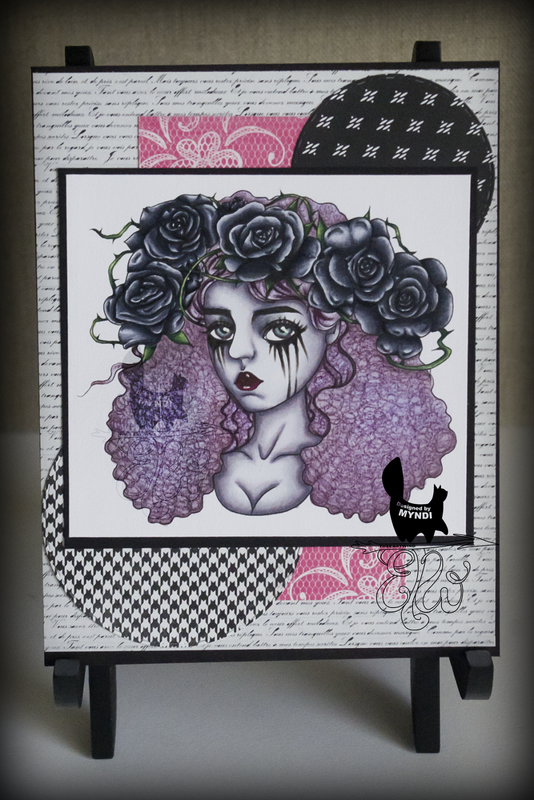 Make sure you check out the ongoing Rubbernecker challenge for your chance to win all the stamps used on a Rubbernecker DT card you comment on by visiting the designers blog. Left of Center Creative Challenges is celebrating their 150th Challenge on October 1, which is also National Card Making Day. The East Wind is sponsoring this challenge and The East Wind DT was asked if any of us would be interested in making a card for this celebratory and dark themed challenge. I put my hand up and decided to do something with Lucy Loo 'Devil'. I decided to go monochrome with this, which is something I haven't done before. Technically, her hair and wings are a bit purple, so it's not really monochrome, but the colours I used in her skin I wanted to tie in with the rest of her as well. I think you have to look at it twice to see that it's not a black and white picture. I debated taking the picture again with a different background, but I thought the skulls suited it, so I kept it as is. I coloured the image with Copics. I used the C's and V90's for everything. I also washed some BG70 over her skin in the highlights, though in the picture it's hard to see the greenish tint. I had this concrete brick wall paper by Ella & Viv that went perfectly with the image. I inked some black stars over the paper, heat embossed some pewter embossing powder over chipboard stars, and there you go. I kept it pretty stark and dark. Check out the new challenge at LOC and drop by The East Wind if you do something with a TEW image and let us see what you did!